Middlesex players celebrate their County Championship title. One interesting day at the end of a five-month season has not ‘saved’ the County Championship as some (mostly Yorkshiremen) rushed to claim last week. Indeed an admittedly dramatic final day was actually an affront to natural sporting justice. Toby Roland-Jones celebrates the wicket that clinched the County Championship title for Middlesex. The manufactured, contrived finish between Middlesex and Yorkshire which denied Somerset the title was as much a case of match fixing as the infamous West Germany/Austria World Cup football match in 1982. Those countries decided the result they wanted before the start of the game and played out a 0-0 draw to ensure their progress ahead of more deserving opponents. There was no attempt by either side to win that contest, but the lack of ethics is similar to what went on at Lord’s. The Home of Cricket was shamefully the scene for three and three quarter days of sheer tedium followed by some slapstick sport that should have embarrassed all those involved. Faced with a disgracefully lifeless pitch, Middlesex and Yorkshire lacked the skills to force a positive result in four days so indulged in some deliberately poor bowling and comedy fielding. Middlesex players Sam Robson and Steven Finn (right) with the County Championship trophy. It was an unedifying spectacle rather than an exciting one. 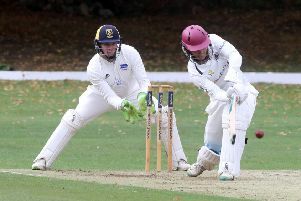 Four-day County Championship cricket was introduced to assist England’s national team and to stop the manipulated finishes commonplace when matches lasted three days. Middlesex were second-best against Yorkshire and yet got to celebrate a hollow victory. They may as well just have played a 40-over game rather than bore everyone senseless for 20 hours or so. No doubt England officials Andrew Strauss and Angus Fraser were thrilled their own county finished top of the pile. Middlesex’s involvement of course had no bearing on the decision not to allow Yorkshire to field their strongest team. It’s good that Fraser now has England at heart. In his days as Middlesex supremo he used to invite Australians to play for his county so they could acclimatise to English conditions ahead of an Ashes series. Jonny Bairstow and Joe Root should have been allowed to play against Middlesex. After all England fast bowler Steven Finn was able to play for Middlesex. England are playing Bangladesh next so fatigue won’t stop us winning. We’d beat them with a team of sleep-walkers. Post-match those desperate for the County Championship to stay relevant as a sporting contest predicted a great revival would now follow. This of course is nonsense. There’s a reason why the County Championship finishes with matches played during midweek days when most fans are at work. Cricket at this level can’t compete with lower league football, horse racing or Strictly Come Dancing.